One idea that I like the sound of (with a couple of reservations) is the concept of participatory budgeting. This is a way of giving citizens a say in the prioritisation of public spending, by allowing them to vote on which projects or programs proposed by the community should be supported by the government. (p. 39) This sounds like a good way of helping people to see where their tax dollars go, and to be realistic about what can be achieved with the size of the pie that’s available. But I’d want to see safeguards to ensure that minorities aren’t marginalised and to make sure that we don’t spend even more money on populist items at the expense of other things that matter too. (An obvious example of this is government spending on sport compared to literature, art and music.) It goes without saying that citizens would need to be involved from the beginning so that the pros and cons are properly canvassed, and that safeguards reflect the values we hold. Amongst other possibilities, there are clever ideas about increasing participation in political parties, about improving the charade that is Question Time in parliament, and about citizen juries to debate political reforms. However, the important thing about these ideas is that they start a conversation that goes beyond the usual negativities about our political processes. This analysis is confirmed by research done by the Australia Institute in 2013. We have argued that capital income is a growing part of the inequality problem because an increased share of Australia’s prosperity is flowing to holders of capital. Our tax system is exacerbating this problem. Today, more than a third of superannuation tax concessions go to the top tenth of income earners. That same group yields approximately 70% of capital gains concessions and one-third of negative gearing concessions. These federal policies provide far more preferential treatment to the dollars earned from capital than to the dollars that workers earn from labour. Imagine two people earning eighty thousand per year. One receives his money in wages and owns no investment properties; for every additional dollar he earns, he pays one-third in tax. The other gets her income from capital: superannuation, share dividends and rent from several investment properties. Her super earnings attract only 15% tax, and her investment properties attract further perks. Negative-gearing entitlements mean tax on income from shares or rent can be offset using interest payable on loans for investment properties. Expenses on the properties can also be used to further deduct tax. And if she decides to sell a property, she’ll receive a 50% discount on the tax she would have paid if she’d earned the same money through wages. If these two chapters are anything to go by, this book is a must-read for thinking Australians. 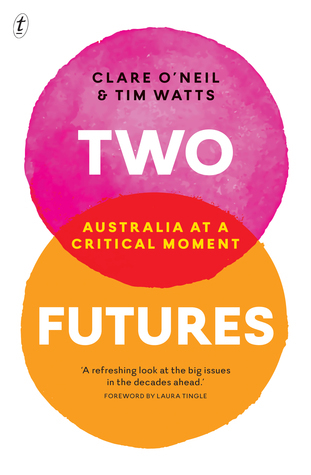 I am sorely tempted to skip ahead to the final chapter, which ‘bookends’ the two futures of the title that Australia might have. But I’m going to resist that, to give what I’ve already read time to percolate. Highly recommended, especially if you are not interested in politics! PS You can hear Clare O’Neil in conversation with Marius Benson at Soundcloud. Thanks, you’ve reminded me of this book which I noticed when it came out and promptly forgot. I’ll certainly be reading it. Chris Bowen’s book about Aus treasurers and Andrew Leigh’s about luck in politics also look interesting. There’s another interesting one that I’ve bought but haven’t read yet: it’s called Catch and Kill (silly name!) and it’s about the Bracks government. It’s been very positively reviewed so I’m expecting it to be good.